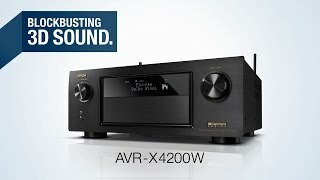 AVR-X4200W is rated 4.0 out of 5 by 2. Immerse yourself in thrilling 3D surround sound with the Denon AVR-X4200W A/V receiver, which features Dolby Atmos surround decoding for the ultimate home theater listening experience with today's blockbuster soundtracks. And, via a firmware update, the AVR-X4200W will be able to decode forthcoming DTS:X immersive surround soundtracks. Both Dolby Atmos and DTS:X feature object-based surround sound with the ability to drive overhead speakers to deliver the ultimate immersive 3D audio experience. Featuring an advanced video processing and switching section, the AVR-X4200W features full 4K Ultra HD connectivity and HDCP 2.2 compliance. Equipped with built-in Wi-Fi and Bluetooth with dual diversity antennas, the AVR-X4200W lets you listen to your favorite music from streaming services including Pandora, SiriusXM and Spotify Connect, and you can listen to any of thousands of internet radio stations. You can also stream your favorite tracks wirelessly from your iPhone, iPod touch and iPad via AirPlay. The powerful amplifier section features discrete high current output devices on all channels, and all amp channels are configured identically. Rated at 125 watts per channel(8 ohms, 0.05%THD, 20Hz~20kHz), the AVR-X4200W has the ability to drive lower impedance 4 ohm speakers on all channels. Dolby's new Atmos surround sound technology dispenses with channel-based coding in favor of more advanced object-based coding, giving the sound designer the ability to precisely place sounds anywhere in the 3-dimensional space. Now, you can enjoy this same award-winning technology at home with the AVR-X4200W, which features the ability to connect a 5.1 surround sound speaker system and 2 additional overhead speakers or 2 additional Dolby Atmos elevation speakers for the ultimate home theater experience. Thanks to the 9ch processing capability, you can just add an external 2-channel amplifier and even enjoy a thrilling 5.1.4 or 7.1.2 channel Atmos experience. Along with Dolby Atmos decoding and Dolby Surround Upmixing, the AVR-X4200W also features Dolby TrueHD lossless decoding and other Dolby Digital technologies. DTS:X and DTS Neural:X Upmixer can be enabled through an online firmware update. For more info, please visit www.denon.com/dtsx. By fully immersing the listener in a cocoon of life-like sound, Auro-3D puts you right in the middle of the action. Auro-3D provides an immersive surround sound experience thanks to dedicated height and overhead channels, in addition to the regular channels. The height information, captured in recording or created during the mixing process, is mixed into a standard 5.1 PCM stream that comes with a regular Blu-ray. Moreover, the Auro-3D Engine combines different technologies to guarantee an optimum 3D sound experience generated both natively and from existing audio content. It recognizes mono, stereo, 5.1 surround or an Auro-encoded signal and transforms them into 3D audio. Once upgraded with the Auro-Codec decoder, the Denon AVR-X4200W is capable of decoding the original Auro-3D mix and playing back an Auro-3D 9.1 channel configuration (with external 2-channel amplifier). When connected to a compatible Denon Blu-ray player, our exclusive Denon Link HD system provides a dedicated pathway for the critical timing data to eliminate distortion caused by jitter errors in the main data stream. Denon's exclusive AL24 Processing Plus provides ultra high resolution digital audio filtering and precision tailoring of the main (L/R) audio channels, to deliver shimmering detail in the highs, along with smooth natural midrange and a broad soundstage with improved imaging. In order to properly handle the multitude of advanced digital audio decoding and processing functions, the AVR-X4200W features an sophisticated DSP audio processing system that incorporates no less than 4 powerful high speed fourth generation SHARC DSP processors, which together have a combined continuous processing capability of 10 GFLOPS (10 billion floating point numerical computations per second). Prepared for the future, the AVR-X4200W features an advanced video section that's fully compatible with the latest HDMI 2.0a and HDCP 2.2 specifications on all 8 HDMI inputs. With 4K Ultra HD 60Hz video, 4:4:4 Pure Color sub-sampling, High Dynamic Range (HDR) and 21:9 video, 3D, and BT.2020 pass-through support on every input, the AVR-X4200W is ready for the next generation of Blu-ray disc players, set-top boxes and other 4K Ultra HD sources. Certified by the Imaging Science Foundation, the AVR-X4200W features a full suite of video calibration controls (for use by an ISF technician), along with ISF Day and ISF Night video modes. The AVR-X4200W features 8 HDMI inputs, including 1 conveniently located on the front panel, and 3 HDMI outputs - 2 for the main zone, and 1 for the 2nd zone. Featuring Bluetooth & Wi-Fi wireless streaming connectivity, the AVR-X4200W is equipped with an advanced dual diversity antenna transceiver system for robust and error-free streaming, even in congested RF environments. Connect to the internet through your home Wi-Fi network (or with a hard-wired connection via the RJ-45 Ethernet LAN port) and enjoy your favorite tracks from streaming music services such as Pandora, Sirius XM and Spotify Connect, as well as from thousands of internet radio stations around the world. With AirPlay, you can enjoy listing to your favorite tracks wirelessly from your iOS device, including the iPod touch, iPhone and iPad, and the AVR-X4200W is also DLNA 1.5 certified for compatibility with your home PC or Mac. The Denon AVR Remote App lets you easily control the AVR-X4200W with your favorite portable device and it's available for iOS, Android, and Kindle Fire devices. The AVR-X4200W features a sophisticated power amplifier section with all 7 channels configured identically, employing discrete high current capable power transistors. Each channel is rated at 125 watts (8 ohms, 20Hz~20kHz, 0.05%THD) and all channels are able to safely drive lower impedance speakers (down to 4 ohms). Equipped with the full Audyssey Platinum suite of advanced DSP algorithms, the AVR-X4200W features Audyssey MultEQ XT32 automatic room acoustic correction. With the supplied measurement microphone, MultEQ XT32 analyzes each speaker's output (including the subwoofers) at up to 8 measurement locations and generates precision digital filters that optimize each channel for the correct frequency and time domain response. The AVR-X4200W is also Audyssey Pro Installer ready. You can enjoy your favorite movie in the main room, while others enjoy stereo sound from different sources in 2 other rooms. The AVR-X4200W is equipped with speaker connections for a 2nd stereo zone, and pre-amp outputs for a 3rd stereo zone. There's also a dedicated HDMI output for 2nd zone audio and video so you can watch and enjoy 2 different video sources at the same time. You can also connect a USB drive and listen to MP3 and WAV files, and the AVR-X4200W features high resolution audio file compatibility, including DSD (2.8 MHz) and FLAC lossless decoding up to 24-bit/192-kHz. Featuring a clear, easy to understand graphical on-screen display, the AVR-X4200W guides you through the setup process that ensures the right configuration the very first time. Our exclusive Setup Assistant and the included Quick Start guide together provide easy setup guidance, optimizing critical settings for the best possible sound quality with your particular equipment configuration. Denon's acclaimed HEOS whole home audio system features advanced multi-room, multi-source audio streaming, and the AVR-X4200W features IP control capability with the HEOS Link, so you can control the receiver with the HEOS app. As part of Denon's IN·Command series of custom integration friendly A/V components, the AVR-X4200W is equipped with a range of features that provide enhanced control capabilities and compatibility with 3rd party and custom integration solutions. For remote control compatibility with other components in your home theater system, the AVR-X4200W features an IR (infrared) remote control input and remote control output on the rear panel, along with dual 12V trigger outputs. The AVR-X4200W can also be set up and operated by a home computer on the network via IP control, either via wired LAN connection or via Wi-Fi wireless connection. For direct connection to external home automation and control equipment, the AVR-X4200W is equipped with an RS-232C serial port. The AVR-X4200W also features Control4 SDDP (Simple Device Detection Protocol) and Crestron Connected certification for quick and easy integration with Control4 and Crestron home automation equipment. Rated 5 out of 5 by GoBills from Power House!! upgraded from an earlier Pioneer Elite and the Denon is a great upgrade! A/V receivers have come along way in audio processing and the X4200 is packed with options. Rated 3 out of 5 by Alexny from The sound effects are very low. Dolby Almost is not too good. I bought the latest version, Auro 3D for $200 & I did not hear a big difference. The sound effects are very low. I honestly think Pioneer is better. Auro 3D should make an update to better the quality.